This next panel is from "The Golden Tree" by Carl Barks, which you can read here. I'd say more, but that would give the entire story away. I understand that Barks didn't really like writing and drawing Christmas stories. But somehow he did such a good job of it! Quality products even when he doesn't care for the material? There's a pro, right there! 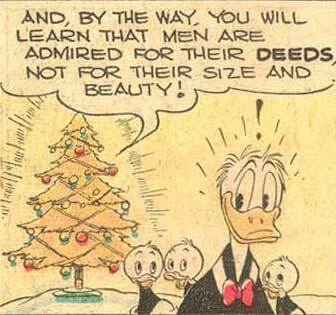 I'm still amazed that Eisner did so many Christmas stories, since he's, you know, Jewish.